Inspired by Belly Timber, somebody thought it would be a fun idea for food bloggers to post up pictures of their kitchens. As we live in rented accommodation I can't really consider this kitchen to be the product of my dreams or anything meaningful like that. But, apart from the undesirable oven, there are several things I absolutely love about this space. Space is the key word. Our kitchen is lofty, open and easy to keep tidy and clean. I am not the neatest person in the world but I can't abide mess in the kitchen. If you strain your eyes a little, you will see that I have only a few of my very favourite things on view. Deep in the corner, my orange Kitchen Aid, my toaster (life wouldn't be worth living without toast) and my pestle and mortar. Up on the wall is my Michael Lewis painting, "Sidney and Michael Coming Back" and on top of the cupboards we have some crew-gift movie memorabilia like our Yoda statues from Star Wars Episode 3 as well as a couple of wine bottles I liked so much, I couldn't thow them away. Archive Alert! On this date in 2004 we were dining at Watercress on Valencia. How prettily your pantry is organized! And of course I noticed the two jars of marmite - can a house ever be without (never, in my mother's opinion). I've always wanted such a space, place to devote solely to food storage. The high ceilings and counter space in your kitchen are surely enviable. I like the soothing colors of your kitchen. And your pantry is huge! Wow! Well, if you're going to rent, might as well have a gorgeous kitchen. I wish I had room for a pantry. Maybe if my home was another 40 years older, I'd surely have one. Hey, did Fred get a place to store his scotch? I love your kitchen. It has a wonderful feel to it that is apparent even in just the one photo. Am so envious of the tall ceiling. P.S. Great pantry pic, but it's totally obvious the conveniently-cropped-from-the-photo bottom shelf is completely full of Marmite. It's okay, Sam. You don't have to pretend you only eat it out of those tiny jars. We all know about your, um, problem. Don't try to hide it. Just come out of the pantry, and you'll feel much better. Really. Man, I cannot remember the last time I had a packet of refreshers. Are they even still called refreshers? or did they go the way of Marathons and Opal Fruits? I see stuff I like. I also see Birds Custard Powder! I laugh. Sam, your kitchen is beautiful. It is difficult to find a spacious kitchen in the City, and almost impossible to find a pantry... you scored! Hurray! I really like the pantry. I also love the spacious look of the kitchen. My shoulders relaxed just looking at your kitchen--what soothing colors and wonderful natural light! We have a small kitchen with very little counter space. 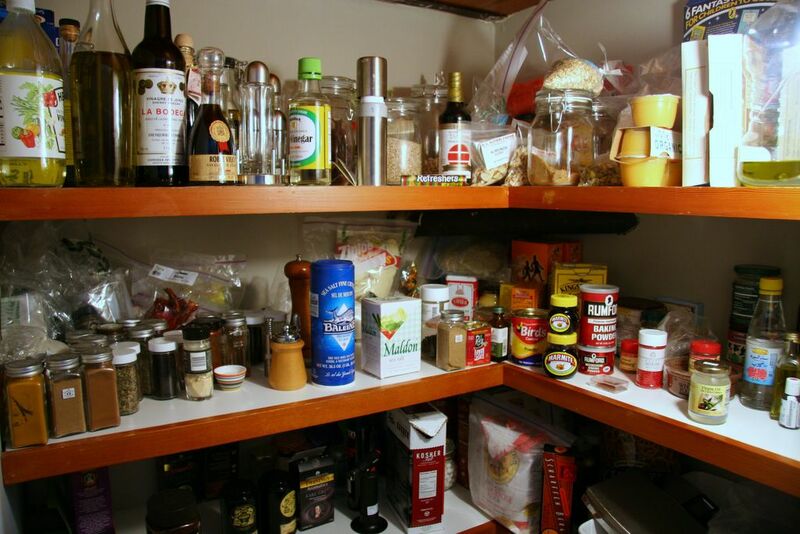 But we are grateful for a large pantry too--it makes life in the kitchen that much more maneagable. Tara - why thank you. But really it is due for a reorganization. The marmite goes without saying. Beth - the colour of the cupboards is totally sludgey in reality but I managed to catch the morning light just right so it fdoes look quite nice. Jen - We are lucky, yes, this kitchen is a place i feel happy and relaxed in. It's my space. Once you live in a loft, you will find it hard ever to not live in one. I bet this apparment doesn't cost any or much more than yours. Dr B - I am sure you could build a pantry in the yard? Maybe too much effort. Of course he does. I am not going to tell you which cupboard. Farmgirl - I did save all the marmite jars for the last 5 years and they were stacked up in the cupboard but about 2 months ago I had a littlemoment when I decided to clean them all up and put them in recycling. Of course you can still get refreshers. Go and get some. I ate a whole packet yeaterday afternoon. Cookie Crumb - I really dont eat any crap. I certainly don't eat custard powder. Hate the stuff. There will be a story about how it got to be there, one day, on this blog. Jennifer - the thing is when we found this appartment we were desperate. Fred wasn't keen and we almost didn't take it. Trouble is it is in such a remote place, we have internet access problems. None of the usual providers are around here because no one else lives on the block. Kalyn - yes - it is very calm and relaxing. Jennifer - I am sure I wont be able to live here for ever, and I am not sure I am going to ever be happy without a pantry after having had the luxury of one living here. I grew up with pantries--and I still have one, in a closet around the corner of my kitchen. It is being redone, along with the rest of the kitchen...which is in process now. My kitchen, as I am recording on my blog, currently looks rather sad--but within the space of a couple of months, it will be fabulous. AHhhhrrg. 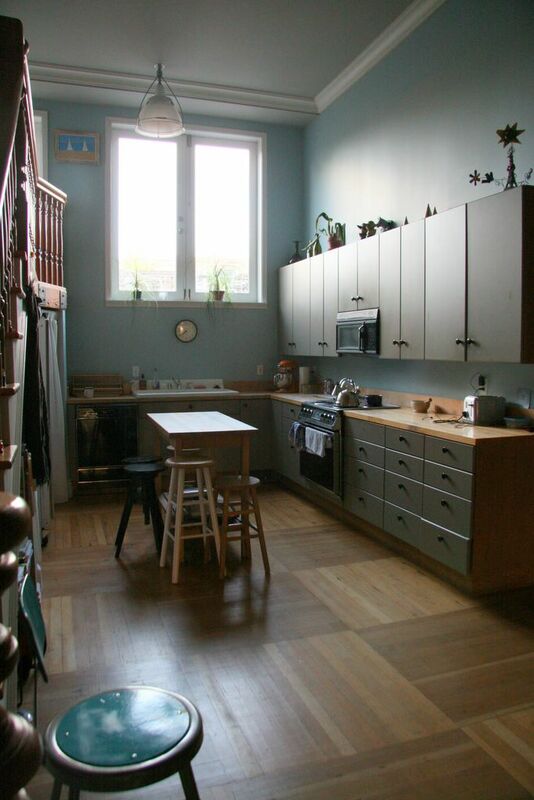 When I lived in SF, my kitchen was (actually, pretty cool looking, but) the size of a postage stamp! That kitchen is a dream! A DREAM. I would post mine too, but heavens, people would just laugh. Thanks for sharing yours though! With my tiny NYC closet kitchen, I am quite in awe of your window (none in mine), your pantry and the counter space. Lovely. Uh, NO. I'm not going to put my pantry in the yard. Sorry, about that. And, I don't have to know which cupboard holds the scotch. Fred is far too kind of a human to play games with Biggles. He's one HELL of a fun person to be around. Maybe if I shared my new DVD? I was going to scream in pain at the marmite, but I see others have beaten me to it! That said... the light in your kitchen is exquisite. What time of day did you take that shot? I can't believe this is a kitchen in a rental--wonderful! Wow, you can't imagine how envious I am. My kitchen is a vertically-positioned shoebox compared to yours! Kevin - I cant let you have it, but I will let you come round and tidy it up for me, how's that? Barbara - it sounds like you are going to make everyone jealous with your new kitchen - and a Aga! wow! Of course, i didn't grow up with one because we weren't a grand family living in the country. I had a romantic notion of one and read all the catalogues when I finally got my own house in London, but of course, I never got round to it. It always sounded like a very homely thing to me. Congratulations. Racahel - it is just luck. I used to live in a letter-sized appt with a postage stamp kitchen and no parking in Russian Hill and we paid $400 a month for it than we do here. This appt is in the middle of nowhere. Apart from our neighbour downstairs, we are the only humans on the block. But the kitchen does look nice, it's true, esp in the picture. Rose - our apptment used to be a photography studio so it has great ligthing during daylight hours. We are lucky. Zarah Maria - thank you! Dr Biggles - here is a clue. Only one cupboard has no shelves in it,making it tall enough for bottles. Only one cupboard is out of my reach. We will have to find a way for you and Fred to share another wee dram soon. Mrs D - it was very early in the morning, around 7.15 am just as the light was coming up, In fact - I was trying to get the moon through the window, the big, heavy morning moon, but them the room was too dark so I had to blow out the window in the shot to get the room with enough light. It's ok - the marmite isn't going to hurt you. Thanks for comin up with this idea. It has become a meme in the best sense of the word. Shuna - if only I had a decent oven though!? We will have to do another class. Beastlysum - the amazing thing - is it is not an expensive rental. I have lived 5 other places in SF, and this one is a steal. Melissa - you create such amazing things out of your kitchen - the fact that it is a shoebox makes your magic all the more amazing. "I cant let you have it, but I will let you come round and tidy it up for me, how's that?" I'm just weird enough to enjoy that. hi sam, what a calm oasis! your kitchen looks so serene, soothing and spacious - the excuse they call a kitchen in our apartment is about the size of a galley...i'm totally envious! What a beautiful & spacious kitchen! I'm so jealous! kevin - if you are self confessed wierd, i think you might know which kevin you are. J - it is calm, and although our appt is completely open plan, this is where I retreat when i need to relax! Grace - I noticed you did that (blushing), thank you for the shout!